Audrey over on the fabulous handcraft blog HGK was looking for pattern testers for her very cute owl medallions. 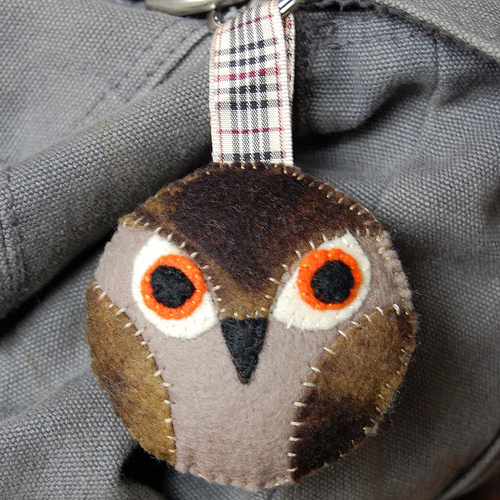 Audrey's owl medallion. Picture taken by her. I have always loved owls. I love how they symbolize knowledge, and I love them a little bit extra since they remind me of my mother and her owl collection. So of course I wanted to test her pattern! I got the pattern as pdf file and could just print it. 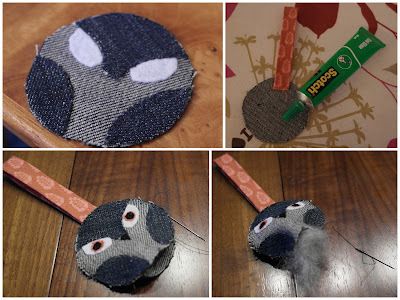 The pattern was really easy to follow with detailed instructions. Audrey recommends that you use felt and will be selling the pattern as a package together with the materials needed for it. I decided to make use of some fabric I already had at home and made the owl out of jeans fabric. 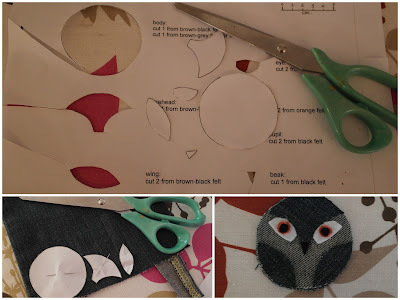 Cutting the pattern, then cutting the fabric. The pieces fit perfectly together. I did make it a little hard on myself by using jeans fabric instead of felt, but that had all to do with my own stupidity (yes, 3 layers of jeans fabric is hard to hand stitch) and nothing to do with Audrey's pattern. filling the medallion and then closing it. Without any major accident (only once did I stitch myself with the needle so hard I started to bleed) I finished the medallion in around an hour and now it hangs on my favorite hand bag to bring me luck. It is perfect on my bag! You should all hurry over to HGK and check out all the other cool things Audrey is doing! I know! I love them! I'm going to make more of them in different colors. I love owls! I'm thinking of getting an owl for my next tattoo even! So cute! Hahaha, so am I! I'm waiting for the design and the location on my body to fall in place (for my two previous tattoos I'd contemplated for quite some time before I just kind of got a revelation of how it was supposed to be). It is! You should keep an eye out on Audrey's blog for when she puts them up for sale! I'm glad you liked it, because I really enjoyed the work with the owl! I plan on making several more of them! It really turned out cute, didn't it? I love your beautiful leather bag....I have bag envy now! Hugs!